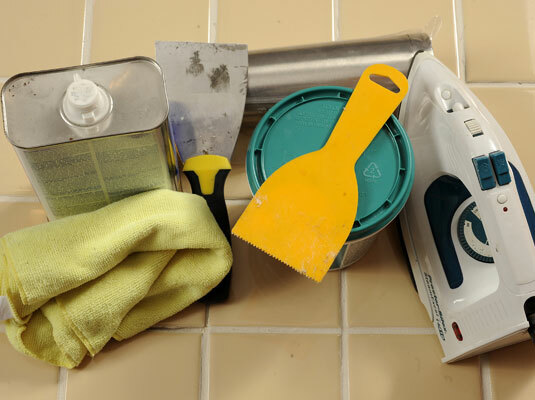 Gather your materials: Iron, tile adhesive, putty knife, mineral spirits, rags, rolling pin. 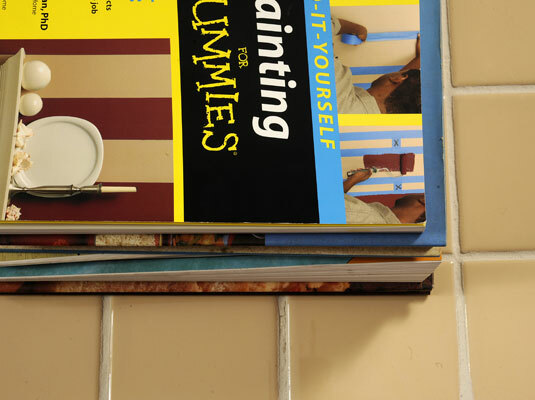 You’ll need just a small tub of tile adhesive. Check here for more on getting your room ready for tile floor. 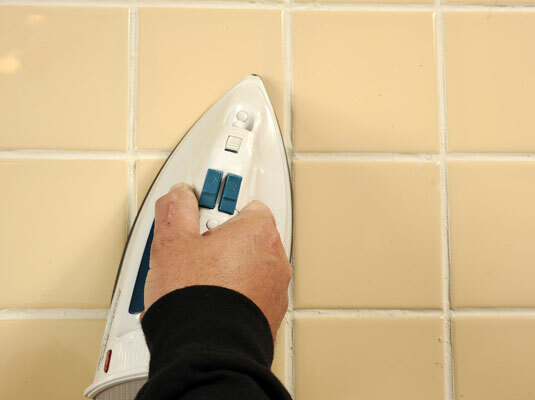 Warm the tile with a preheated iron. Don’t force out the tile. It could break. 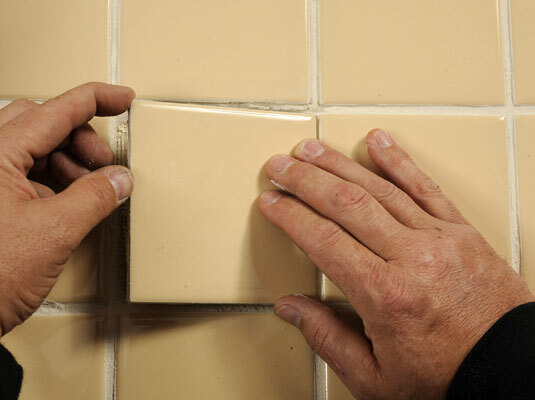 Heating the tile with a warm iron will loosen any adhesive that might still be holding the tile. 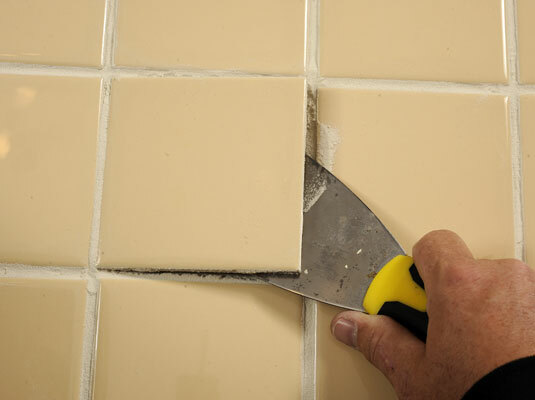 Lift out the loose tile with a putty knife. 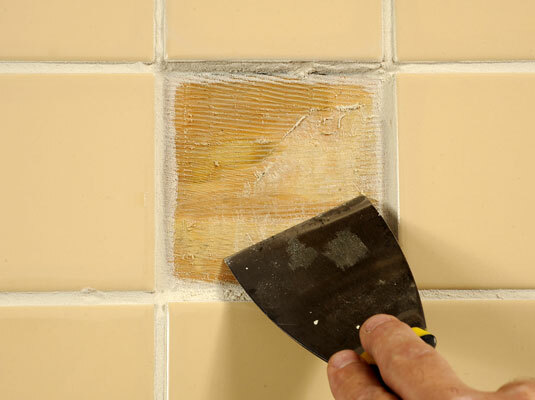 Carefully lift the loose tile with a putty knife, working from center to edges on all four sides. Set the tile aside. Dissolve the adhesive on floor. A rag dampened with mineral spirits works great to dissolve the adhesive. Use your putty knife to scrape away the dissolved adhesive goo. Get it all out before you apply new adhesive. Warning: Make sure your scraper doesn’t slip and damage surrounding tiles. If you encounter a stubborn spot, use the iron again to warm the adhesive, then scrape it out. Apply adhesive to the new tile and to the floor. Coat the empty patch of floor with adhesive. You should have enough give to be sure get the tile is positioned just right. Roll it with the rolling pin. Pressing hard with the rolling pin will get rid of any trapped air pockets that will cause the tile to lift up. 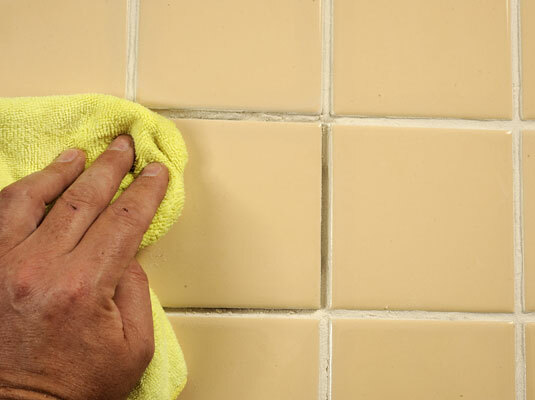 A rag dampened with mineral spirits will clean up any adhesive around the edges of the tile. Weigh down the tile with books. Weigh down the tile with books for a day or two until you’re certain the bond can’t be broken.